The Habitat advocate is a voice for native habitat. We welcome support for our website and for our advocacy to conserve and protect wildlife and their habitat. All funds received by us at The Habitat Advocate are deposited into a dedicated bank account in the name of ‘The Habitat Advocate’, which is held with the Katoomba & Upper Blue Mountains Community Bank ®, a branch of the Bendigo Bank. All funds in this account are only used to pay direct costs to maintain The Habitat Advocate website – essentially website registration, hosting and development costs. The funds are not used for any other purpose. We have no office, no paid staff, no equipment and it is an undertaking of the owners that this organisational model shall not change, ever. The owners of The Habitat Advocate do not draw any funds from this account, instead only offer their time, personal equipment and contributions on a strictly voluntary and philanthropic basis. 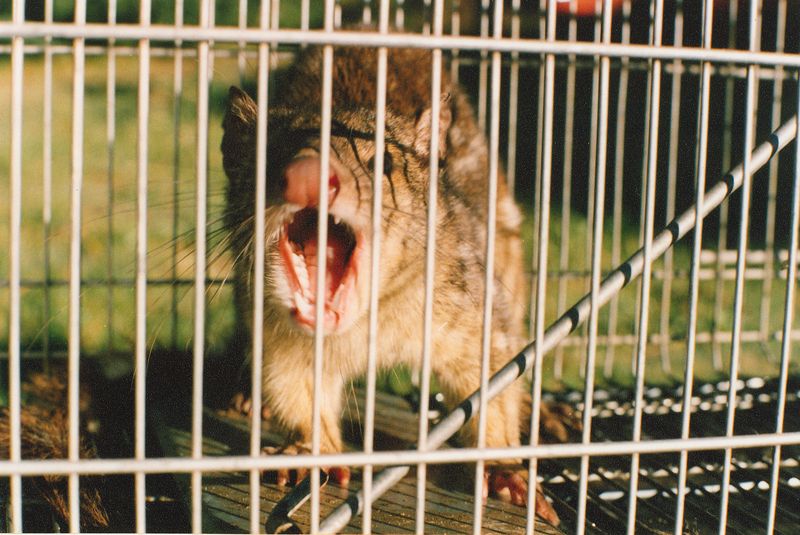 Wildlife have no voice, and we seek to be part of their voice for rights, respect and justice. Confidential Donations, are as the term suggests, strictly confidential between the donor and The Habitat Advocate to solely support our advocacy work. The Habitat Advocate undertakes to maintain that confidentiality in perpetuity. At The Habitat Advocate we recognise that the nature of our wildlife habitat advocacy by its inherent nature inclines to be controversial, often because it challenges deep cultures. We also recognise that many in the global community, while personally supporting the causes we take on and the stances we take, do not want to be publicly connected with such support due to concern for implications. We acknowledge this pragmatism is prudent, sensible and justifiable. We respect every person’s right to anonymity and so we make available the option for ANYONE to donate to The Habitat Advocate anonymously. In accepting such a donation we therefore impose no rules nor restrictions. Since we cannot know who an anonymous donor is, we can provide no acknowledgement or receipt to such a donation, but we nonetheless thank the donor wholeheartedly for their support and generosity. At The Habitat Advocate we similarly recognise that confidential supporters require confidential recognition of their donations to The Habitat Advocate. We are equally appreciative and accordingly we provide a receipt for each confidential donation. In order that we may distinguish Confidential Donations (requiring a receipt) from Anonymous Donations that do not requre a receipt, The Habitat Advocate requires the donor to email us at sponsor@habitatadvocate.com.au specifically requesting that we email a receipt. Such an email request to us needs to be made for each donation, in order that we are prompted to generate a receipt. This means that writing the date in the format as YearMonthDay. So for example, 7th August 2012 is written as ‘20120807’. Note: If your email address before the @ happens to be more than ten characters, then only include the first ten characters + the standard date. The aim is to ensure that you do not exceed the bank’s 18 alpha-numeric character limit. The Habitat Advocate has a dedicated bank account in the name of ‘The Habitat Advocate‘, which is held with The Katoomba & Upper Blue Mountains Community Bank®, a branch of the Bendigo Bank, in Australia. Explanation: This means that writing the date in the format as YearMonthDay. So for example, 7th August 2012 is written as ‘20120807’. Upon receipt of your donation, provide that you have emailed us your notice of donation, we shall reply by email to you within 72 hours (allowing for operational and bank delays) with confirmed receipt of your donation. We offer and welcome paid advertising on this website. Be a proud sponsor of wildlife habitat advocacy. Importantly, since The Habitat Advocate is a environmental activist website dedicated to wildlife conservation, we consider it vital that any accepted advertiser and advertisement be wholly consistent with the principles and direction of this website. Funding is important so that we continue to be sustainable, but not at the expense of ethical principle. We acknowledge that website advertising is clearly about promoting business offerings to attract prospective customers in order to earn increased revenue and make a profit. 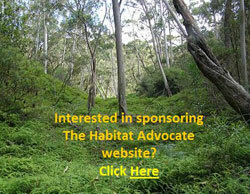 We label all website advertising on The Habitat Advocate as ‘Sponsorship‘. This is because up front, we engage with each advertiser individually on the basis of requiring their endorsement for the content of this website, rather than simply for indiscriminate commercial gain. The Habitat Advocate has a standard broad-based statistical tool that captures only total visitation to our website. This tool does not identify who visits our website, but usefully the total number of visits to our website and the totalnumber of visits to each of our published articles. These visitation statistics allow us to gauge the broad interest in our website as well as to better understand what subject matter most visitors are interested in. Importantly, our Editor’s choice of articles and topics are driven by various factors such as the priority of wildlife issues and the need to diversify the wildlife coverage on our website. However, under no circumstances do we focus on subject matter simply to maximise visitation, as we would consider this unethically manipulative. We invite and welcome contributed articles for publication on The Habitat Advocate from any member of the public, which are consistent with the ‘Purpose of The Habitat Advocate‘ (see above). While an article does not contribute funding, we no less recognise and appreciate that a thoughtful article contributes someone’s personal time and effort (which is funding in a sense) and which helps us in our resourcing of information to this website. After all, this website is premised upon information sharing, and the more information shared helps spreads the writing burden. Good articles include high quality photos, full referencing and have been spell-checked and proof read to add credibility to the author. Authors may chose to use an anonymous pen name and we respect this right of privacy and indeed encourage such wise practice on the Internet. Advocacy is all about the message and it matters not who sends it. We uphold anonymous freedom of speech. The Habitat Advocate is planning to have available on demand the following merchandise as part of our sponsorship offering. Give wildlife a lasting legacy: make a bequest to The Habitat Advocate. Before making a bequest, The Habitat Advocate recommends you seek advice from a lawyer. 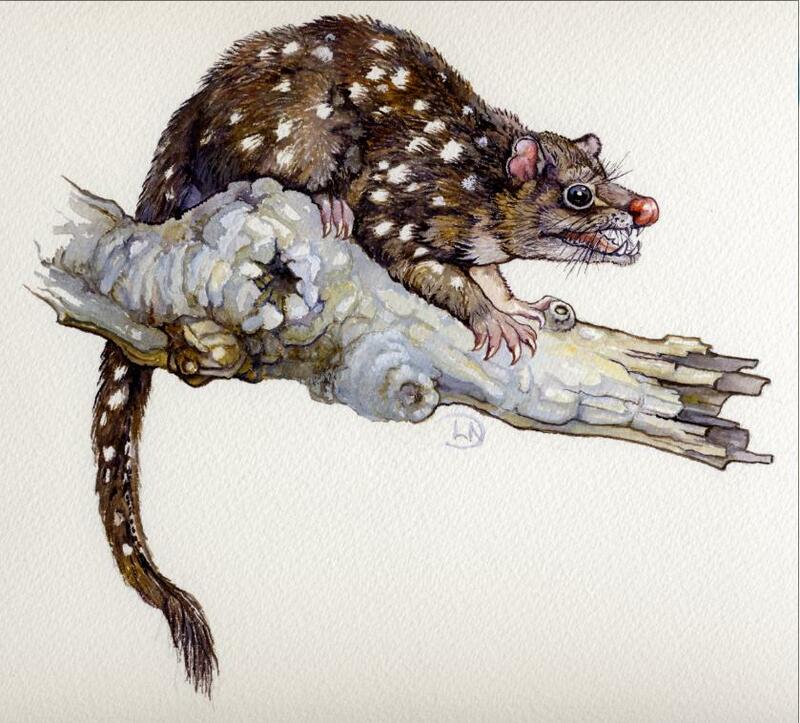 An angry Tiger Quoll captured near Katoomba in 1995 from its native habitat then caged. ..the inspiration for our motto, representative of Wildlife Injustice!